Show your originality and be different from the crowd! Creating something with such visions for our customers involves various thoughts and sets of values. It has been around 122 years since a zipper was born. A zipper has gone through constant trial and error to become what it is now. We have been dedicated to fabricating one and only zippers by making excellent use of the time-honored technology and knowhow. Our hope is to deliver our WALDES Zipper to as many customers as possible. We put such various hopes and desires in each single zipper we make. We also deal with a wide variety of zipper accessories including a hook and loop fastener (e.g. Velcro) with strong sticking power called Veltec, magnet hook, and Vintage auxiliary materials. We make original, unique, only one thing while constantly keeping an eye on what is happening in different arenas to always offer something that fits the times. 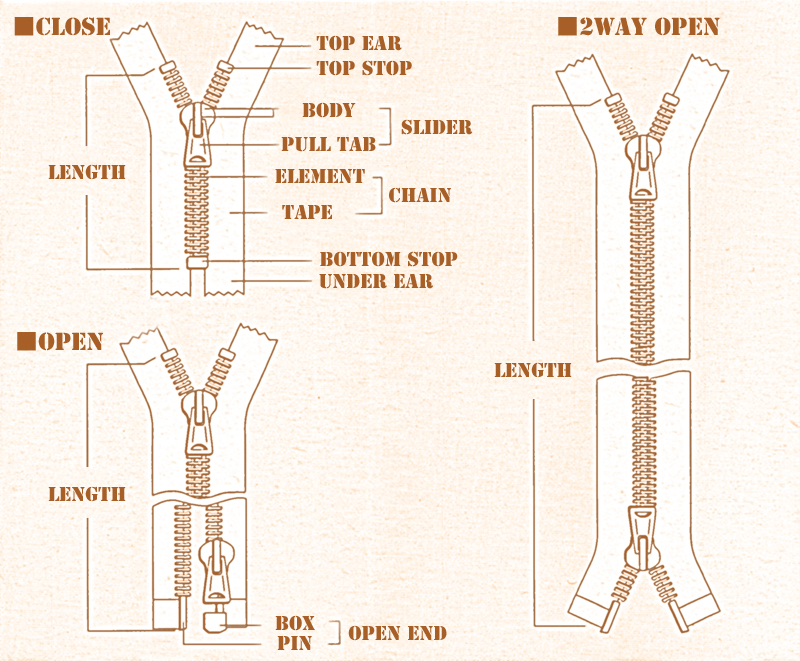 There are various types and shapes of zippers depending on an intended use. It is important to choose the most appropriate type of zippers considering necessary strength and durability for the item to be used. We also custom-make a zipper according to your request, so please feel free to contact us! Our professional staff will help you. it on a tape one by one. The materials can be aluminum, red brass, or nickel silver. injection-mold it on a tape. (2) Duracon: Melt Duracon resin and injection-mold it on a tape. You can choose a tape from polyester and cotton 100% ones. The size ranges from No. 3 to No. 10. The bigger the number gets, the bigger the zipper becomes with increased strength. You can experience what manufacturing one of a kind looks like with this unique and original zipper WALDES. copyright©2012 Asahi fastener all rights reserved.